I've been with Mr. VG for a little over 3 years now. Food-wise, he's a total meat and potatoes guy. Oh and let's not forget cheese. That was about all he would eat or wanted to eat -- burgers, steak, chicken, ribs, mac and cheese, and potatoes cooked in every way imaginable. It didn't matter how, as long as it was a potato. Vegetables were limited in his diet and he would pick out almost every green thing on his plate. Although he was willing to eat Asian food, he didn't like eating it more than once or twice a week. He balked at steamed white rice and wouldn't touch noodles. Fast forward to last week. I was planning our dinner menu for this week and thought I would ask for his input as to what we should have for dinner tonight. Imagine my surprise when he said, "Noodles with some vegetables. You know what kind I like." I quickly scribbled it down. Hey, he didn't have to tell me twice. I was just happy that he's finally expanded his horizons with food and didn't blurt out "bratwurst!" or anything like that. Adapted from Kylie Kwong's recipe, serves 2. The veggies that I used here are ones that Mr. VG enjoys the most but you can use a wide variety of other vegetables instead -- cabbage, bean sprouts, Chinese greens, broccoli, zucchini, just to name a few. Just make sure you don't overcook them. They should be crisp tender. 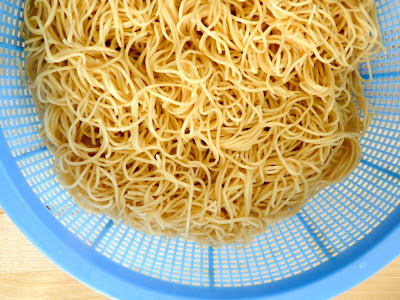 Bring a pot of water to boil then add the dried noodles to it. Cook until al dente and drain well. 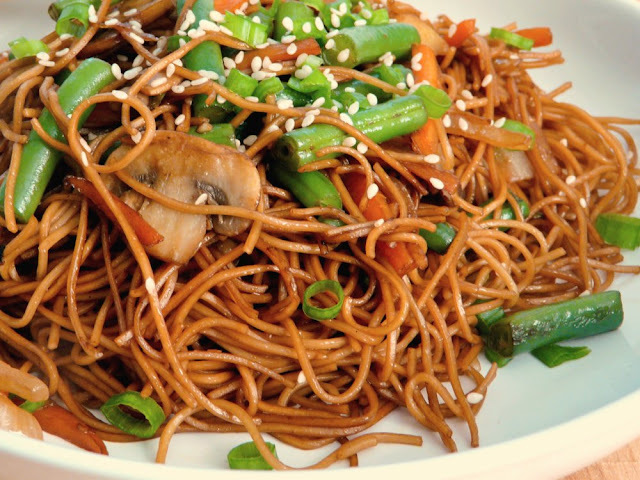 Add the sesame oil to the noodles and toss well to prevent them from sticking. Heat the vegetable in a wok on high heat. Add the aromatics -- onion, garlic, ginger and white green onion -- and saute until fragrant and the onions have become translucent. 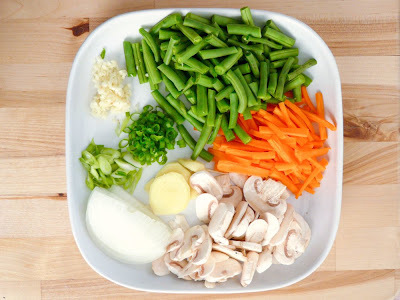 Add the green beans, mushrooms and carrots to the wok and stir fry until they are tender. Note: If your green beans are taking awhile to become tender, you may need to reduce the heat, put a lid on it and allow them to steam for a few minutes. Add a tablespoon or two of water to the pan if necessary. 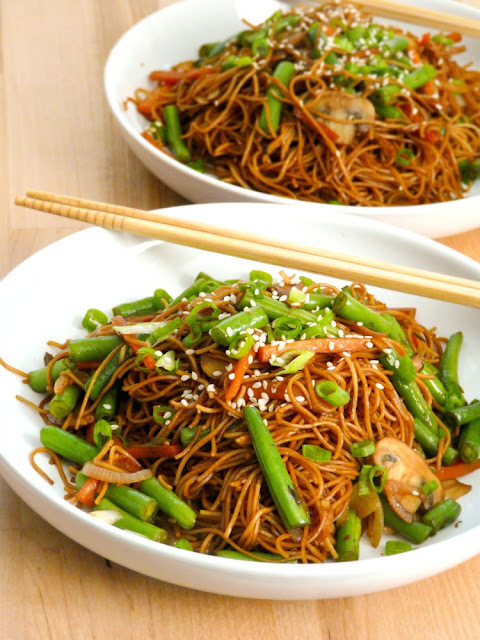 When the vegetables have become tender, add the noodles to the wok along with the dark soy sauce. 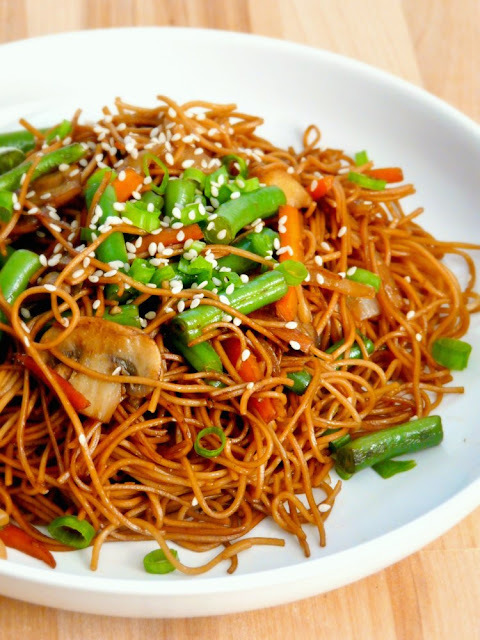 Mix everything together until the vegetables and noodles are coated with the soy sauce . Fry for a few more minutes until the noodles are heated through. Serve hot and garnish with remaining chopped green onions and sesame seeds. 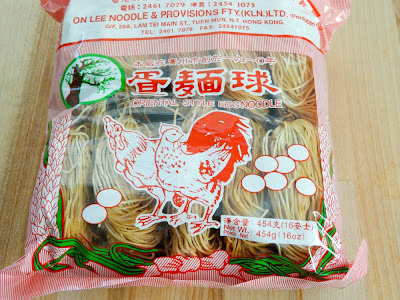 You can use any brand of egg noodles, fresh or dried. This is my favorite brand, On Lee. 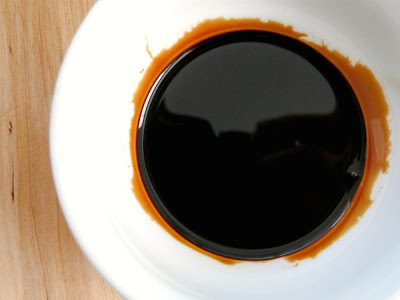 Dark soy sauce is much thicker than regular light soy sauce. It also has a slightly sweeter taste and can be found at Asian grocery stores. Get all the ingredients prepped before the cooking process. some flavor and prevent them from sticking together. Mr. VG inhaled these noodles. He's learning! This recipe was shared on MMMM (Midnight Maniac's Meatless Monday)! oh my gosh, this looks SOOOOO good! Thanks for sharing! Thank you for sharing! This turned out SO GOOD! Glad you enjoyed it lyssa! I've tried this yesterday and my family really liked it! I wish you could share more great recipes. Thanks for sharing! OMG this is such a great recipe!! My husband loved it. I added chicken leftover from supper last night so good!